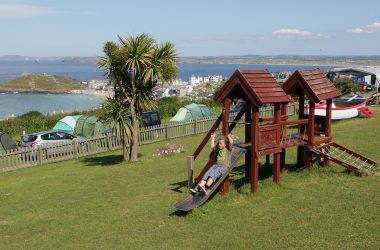 At Ayr, we have some of the best campsite views in Cornwall – but for many of us, a holiday park is only as good as its showers and toilets! So, we’ve really invested in our facilities, making sure that our guests have high quality and well-maintained amenities. As we’re open all year, it was especially important to make sure that the shower rooms are warm and inviting. 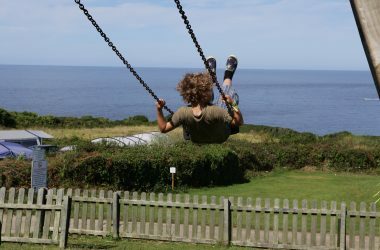 As a family-friendly holiday park, we also want to ensure the kids are entertained on site, so we have a great adventure playground and an indoor games room. Have a look at our facilities, and please drop us a line if you have any questions. Enjoying the outdoor life doesn’t mean you have to sacrifice those essential comforts! Our shower block is of an extremely high standard, with everything you could possibly need. Our underfloor heating keeps your toes cosy after your shower, and there are plenty of showers and loos for those busier mornings. There are separate ladies and gents’ facilities, but there are shower rooms for families to use together, as well as excellent disabled facilities. We also have special baby baths for younger campers, as many little ones aren’t easy to shower! To help you get ready for an evening out in St Ives, there are lots of mirrors with excellent lighting, as well as hairdryers and shaver points. Above all, the amenities blocks are pleasant places to be: light, spacious, modern, and kept exceptionally clean. It’s good to know that all the everyday matters are taken care of, leaving you to relax and enjoy St Ives. There are washing up facilities in the same block as the showers. The chemical loo disposal points are kept incredibly clean and are easy to use. Keep on top of the laundry in our on-site laundrette, which has efficient washing machines and tumble dryers. Tokens are available from Reception. There’s also a place to rinse and dry your wetsuit after a day on Porthmeor Beach. 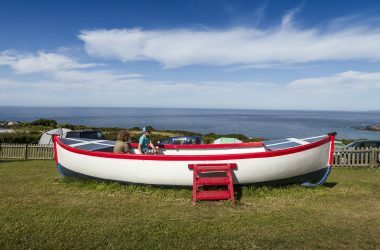 Ayr has a fabulous adventure-style playground for those on-site days. Parents can relax at the picnic tables or benches, while our younger guests have a great time playing pirates on the wooden ship! On rainy days, challenge your family to a pool or table football tournament in Ayr’s games room. Or, walk through the park to The Garrack Hotel next door, and make the most of their indoor swimming pool and sauna. If you want to know anything about Ayr Holiday Park, The Garrack Hotel or St Ives, call into Reception, which is full of information about what’s on in Cornwall. Many of our friendly team have been with us for a while, and have a wealth of local knowledge.